What do you do when the sun goes down at the National meet. Just build yourself a towline glider like 10-year­old Charles Lawrence, above. Man chasing model? 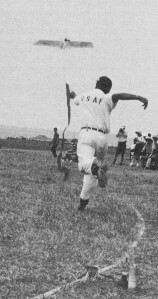 No, member of official U. S. Air Force team in annual American championships hand-launches combat class control line fighting plane. Note paper streamer. All-plastic ready-to-fly beginners gal model, an OK Cadet. Comes with motor, line, flying pole. 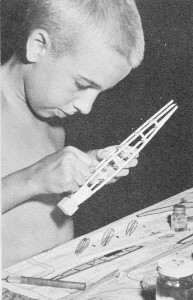 PLASTIC SCALE - Assembling and decorating plastic scale model kits is usually the first activity of the young newcomer to the modeling hobby. He has hundreds of models to choose from. Indeed, the whole history of aviation is spanned in an array of plastic models from the Wright Flyer to the latest jet transport. Minimum handicraft skills are required to put together plastics and most modelers soon build up quite a collection (sometimes to the despair of the lady of the house, who says dusting them can be a problem). Practically all plastic kits provide decals for insignia and other markings. However, the modeler with an artistic bent can make a real hobby out of painting-in these details with enamels especially designed for use on plastics. The wealth of minute detail on today's plastic scale models turns old-timers green with envy. Solid scale exhibition (non-flying) models have always been a part of the modeling picture. Its beginnings were crude compared to today's plastics. A kit used to consist of a rather crudely drawn 3-view, with perhaps a few cross-sections. Wood blocks of pine (early) or balsa (later) were cut to approximate size and thickness. The modeler had to cut or saw these blocks to profile and plan outlines then carve and sand to required cross-section. Eventually manufacturers produced kits with the wood machine cut to near-finished outlines and cross-sections. This was a major advance and took the labor out of the whittling process. But if a modeler wished to crowd on the detail he had to improvise with pins, wire and thread and a smooth paint job was not easily achieved. The modern plastic model takes all these trials and tribulations out of this type of modeling. The very smallest detail such as rivet heads are cast right in the plastic, finish is smooth and results that formerly took hours to achieve now are accomplished in minutes. The plastic scales are a most important first step into model aviation. For the beginner' they serve as a valuable educational function by familiarizing him with the shapes and names of the parts of an airplane. Their decorative value is unsurpassed. READY-TO-FLY - The model types in this category range from the simplest "chuck gliders" and windup rubber powered R.O.G.s (Rise-off-ground) to the electric motor powered and the small gas engine powered plastic flyers. Any and all of them enable the new modeler to progress quickly from the static to the flying stage. 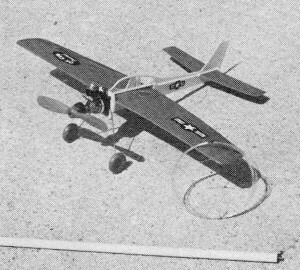 The simplest balsa slip-together chuck glider such as the A-J "74 Fighter" can provide hours of flying fun and at the same time demonstrate the rudiments of flying trim and balance. Though simple looking, these gliders have sheet balsa wings curved to airfoil shape and dihedral giving a high degree of stability and performance. The thick sheet balsa profile fuselage is slotted for the wing and tails providing a knock-apart feature to minimize rough landing damage. By sliding wing forward or back in the fuselage slot the glider can be made to climb and stall, dive or glide smoothly. Tails and wingtips can be bent slightly to give rudder and aileron action changing steepness of bank and turn. Larger sheet balsa gliders can also be launched with a rubber band sling-shot and some have folding wings permitting launch to high altitude with prolonged glide resulting. Progressing from "arm power" to the simplest mechanical power the modeler finds the rubber-powered R.O.G. There are numerous versions manufactured. All are similar to the slip-together chuck glider having formed sheet balsa wing and tails, a sticklike fuselage, a plastic propeller, rubber strand motor, wire landing gear and wheels. 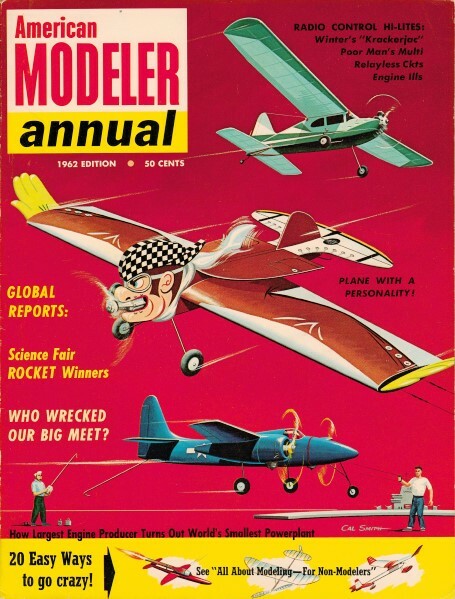 Some "wind-up" models have a free-wheeling arrangement on the propeller so that when rubber power is used up the propeller will turn by itself creating less drag thus giving a better glide. The simple R.O.G. provides excellent training in the handling of power in a model. The modeler becomes aware of the importance of taking off into the wind. He becomes aware of the forces exerted by the rotating propeller on the model's flight. The simple turn and glide adjustments to tail and wing require more careful handling when coupled with propeller power. In addition to the stick fuselage R.O.G. 's other ready-to-fly models have more realistic profile or rotted-sheet fuselages. There are also rubber-powered helicopters which will climb straight up and then descend slowly without damage. The catapult or slingshot folding wing glider idea has also been applied to the helicopter. This model is provided with folding rotor blades that open at top of launch and revolve letting the whirly bird float gently down. All of the chuck gliders, R.O.G. 's and copters have one feature in common. They are flown in free flight, that is, once launched or released they are "on their own." The course of the flight is determined by the adjustment made to the model before launching. In this the modeler has been greatly aided by the manufacturers. Most trim adjustments are built-in at the factory, giving the modeler a minimum of fussing and a maximum of flying fun. A recent novel innovation in tethered or controlled flight type of model is the electric motor powered Stanzel "Electronic jet." This prop-driven model combines plastic and balsa construction and comes completely assembled, ready to fly. A battery powered electric motor is contained in a hand held power unit. The model propeller is turned by a length of flexible cable extending from the power unit to the model. The motor (and propeller) can be turned on and off by a switch. The model can be flown in a 15' diameter circle with the flyer standing in the center. With power turned on model will take-off and can be landed by turning power off. Circular flight can be aided by leading the model with the cable and by "beeping" the switch to vary amount of power. Twisting the plastic tubing housing the cable gives moderate up and down control of the model. This simply controlled and powered model is a fine example of a well-engineered product that provides the young modeler with an excellent stepping-stone to more advanced controlled model flying. The lure of gas engine power is inescapable for the beginner. Fortunately he can achieve early flying success with the many engine-powered plastic control line models available. He will find semi-scale and scale versions of many big aircraft types from antique biplanes to guided missiles. There are also simplified tethered trainer types that require a minimum of flying skill yet still provide good training in engine starting and operation.